When I was at university I read a book called The Celestine Prophecy. Do you remember it? It was a cult book at the time and it seemed everyone around me was reading it. Fictional in nature, it centralised on the theme of coincidences—coincidences not actually being coincidences, but in fact the universe/higher powers delivering messages for those willing to receive them. While I was initially hooked the book lost me at ‘levitation’ (far too ridiculous for my English cynicism), however it did leave in me a deep and lasting ‘openess’ to the presence of repeated ‘signs’. Until three weeks ago I swear I had never even heard of tongue cleaners! In the last three weeks however they seem to have popped up everywhere; I walked into an organic super market in Byron Bay to buy toothpaste and they were next to the toothbrushes (had never seem one before so picked it up, took a look, thought ‘tongue cleaning … really?? ?’ and put it back down again), read a blog post from someone I like to follow and the very next post was for a tongue cleaner, looked for products at a ‘natural’ website and had a tongue cleaner come up as a ‘recommended product’, then walked into my local health food store to buy some pumpkin bread and saw a display of Dr Tung’s Tongue Cleaners as I walked towards the till. At this point I figured some kind of message was being delivered to me so I duly picked one up. I have to admit once I got home I unloaded my new tongue cleaner onto the bench, and it stayed there for the next week. I finally did some ‘Google’ research however and found that this newly found tool actually had some interesting benefits. 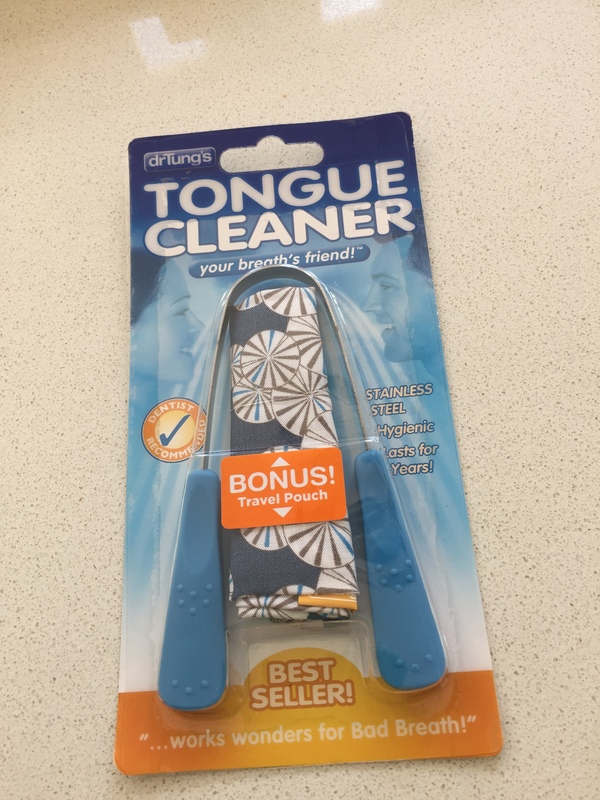 I have always been a tongue ‘brusher’ but I don’t do it all the time as it does make me gag—hence I think my reluctance to give the tongue cleaner a go. Surely putting a metal prong into the back of my mouth was going to be worse? Actually when I finally gave it a run it was completely fine. No gagging at all—although when I saw what was scraped off of my tongue my stomach did a little flip…eww! Using the cleaner is easy. You simply put it as far to back of your tongue as possible (I promise this didn’t make me gag at all) and scrape it forward 5-10 times, washing it under water between each scrape. I have only been using it for a couple of days (morning and night after brushing) so can’t claim to be seeing any major benefits. But strangely my tongue does feel different—in a good way. My tongue feels fresh and ‘renewed’ (much like how your feet feel when you first put on your shoes after a great foot scrub treatment) and I do think that my taste is improved. For that alone I say it is worth a try. Dr Tung’s Tongue is just $9.95.